The Ponderosa mine is now producing commercial quantities of the gem-quality labradoritefeldspar known as sunstone. This gem material exhibits unique optical and physical properties that include a wide range of saturated body colors, aventurescence, and strong pleochroism. The feldspar is An70 labradorite, a high calcic plagioclase; the aventurescence-causing inclusions have been identified as pure native copper. Micoprobe analyses conducted on colorless, red, and green samples did not reeal any obvious causative mechanism for the exhibited colors, although ongoing research is investigating intervalence charge transfer, possibly involving colloidal copper. Gemological identification involves the use of R.I., S.G., and microscopy. Locality determination (Oregon) is based on the copper inclusions and a distinct pleochroism. In 1985, the Oregon legislature named the gem variety of labradorite called sunstone as the state gem. Currently, there are two known (and one reported) deposits of this gem mineral in Oregon: the initial discovery 33 km north of Plush in Lake County, south-central Oregon, which has been alternately referred to as the Plush, Lakeview, Rabbit Hills, or Rabbit Basin location; a small deposit reported near the White Horse Ranch in southeastern Harney County, in south-central Oregon; and the Ponderosa mine, in northwestern Harney County. The geology and mineralogy of the Plush deposit have been reported in varing detail by a number of researchers (Powers, 1932; Stewart et al., 1966; Peterson, 1972; Pough, 1983; and Hofmeister and Rossman, 1985). Figure 1. Gem-quality sunstone labradorite occurs at the Ponderosa mine, Oregon, in a broad range of colors, from pale yellow through pale pink to dark orange and even a deep red. The rarest material is green. 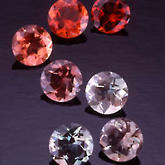 These stones average 0.40 ct. The Ponderosa deposit was discovered in the summer of 1980, when a logging operation cut through the area. Lode claims were staked and pick-and-shovel mining activities began that summer. Mining activity has accelerated since then, and heavy equipment has been added to refine the extraction process. To date, 400 kg of gem-quality rough sunstone have been removed from the Ponderosa mine, 140 kg in 1991 alone. As a result, Ponderosa mine sunstone - in a variety of colors - has begun to find its way into the general gem and jewelry market (figure 1). Extensive study of the Ponderosa mine sunstone labradorite has revealed a number of distinctive characteristics, including aventurescence and pleochroism, as well as provided information to help determine the cause of the different colors. This sunstone can be readily identified on the basis of its gemological properties.